You need a lawyer as soon as you have been denied benefits. If you have been denied LTD benefits, the plan will notify you that you have 180 days to file an appeal. Failure to file a timely appeal precludes any subsequent legal action. Courts have held that claimants seeking benefits under an ERISA plan must exhaust the plan’s claims procedures prior to filing suit. Amata v. Bernard, 618 F.2d 559 (9th Cir. 1980). Therefore, it is absolutely vital to make an appeal in the 180 day period. Because ERISA litigation involves the judicial review of the administrative record of the insurer, only those documents before the insurer at the time of the final denial of the claim (after the appeal) will be considered by the court. Therefore, it is important to make a complete evidentiary record during the administrative claim process. It is absolutely vital that the administrative record contain all of the proper medical records and reports and vocational studies, job descriptions, affidavits of co-workers, friends, and supervisors, Social Security records and awards, and Workers Compensation records and awards that establish the nature and extent of disability and refute the basis of the insurer’s claim denial. These additional documents as well as the appeal itself can be quite extensive and optimally should be crafted by an attorney who specializes in the area of long term disability plans. Before preparing the appeal, the employee should request the administrative file from the insurer. ERISA requires that the plan provide “all pertinent documents” upon which the insurer relied to deny the claim. 29 C.F.R. 2560.503-1(g)(1)(ii). These documents are essential in the crafting of an intelligent appeal since these documents reveal the entire basis of the denial even when the rationale of the insurer is not communicated to the employee in the denial letter itself. One common basis for denial of benefits is the plan administrator’s allegation that certain occupations listed in the Department of Labor’s Dictionary of Occupational Titles are consistent with the claimant’s physical limitations. The plan administrator or insurer may also allege that the claimant’s medical symptoms result from a “mental or nervous disorder” subject to a twenty-four month limitation. Unlike the Workers’ Compensation system, there are no standardized medical or vocational rating systems known to all parties in advance. The language of the plan itself determines the standard of review by the federal judge. Therefore, the appeal should be crafted with an eye to the standard of review. 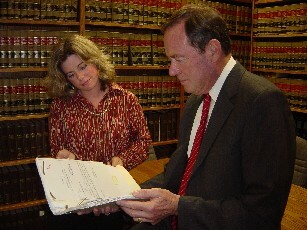 Only an attorney who practices in this area will be able to evaluate the language of the plan. Since most appeals are denied, the appeal itself should be prepared for the federal judge who will be reviewing the appeal in litigation. Remember that, in most ERISA litigation, there is no testimony, no discovery, no jury trial, and the entire case will be decided on motions for summary judgment based on the administrative record. If you do not inform the insurer that your you are also suffering from multiple sclerosis as well as the back injury that caused you to leave work in the first case, you cannot enter this information later in the record before the court. The Law Offices of Silver & Taube can prepare the proper appeal for you. We will review the insurer’s file and obtain the necessary additional information - the medical reports, vocational reports, affidavits, etc. - to try and reverse the insurers’ decision or later win in federal court. We have represented only disabled and injured employees since 1987. Our firm works on a contingency fee basis - if we do not win for you, you owe us nothing. There is no charge ever to review your claim. Insurance companies with whom we have worked include UNUM, Standard, CNA, CIGNA, MetLife, FORTIS, Reliance Standard, Canada Life, Paul Revere, Principal, Prudential Massachusetts Mutual, Kemper, New York Life, High Mark, Aetna, Provident, and others.